Test Data: From show: 1.35 BF 10.1 LE 1.64 WPDA at 365 lbs. This guy fits right in here with "Believe the Hype". Huge Feet, Great big legs, Huge top and rib. I have never seen one with this much body. He is massive skulled, loose spined and long hipped. Guys, study feet and legs. His dam's sire King Indy was the first Berkshire I saw with a perfect hip and hind leg, Double Barrel was the second. The combination of the two made Double Take. Tremendous growth and structure in a big, wide, athletic package. 7-7 on underline. Wide Made. Packed Full of Muscle. 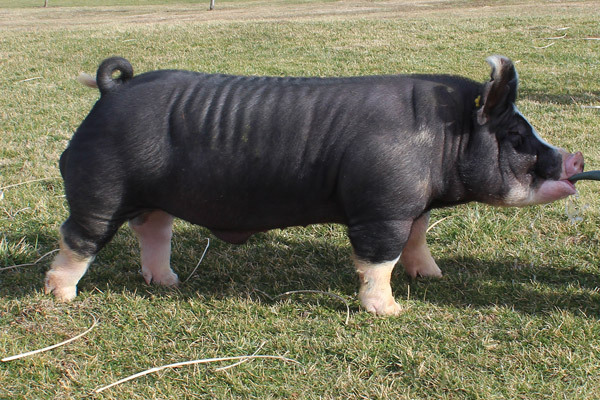 One damn good Berkshire boar designed and bred to make Berkshires the #1 breed.